A tropical wave that is east of the Leeward Islands could be the next named storm -- Patty -- of the 2018 Atlantic hurricane season. 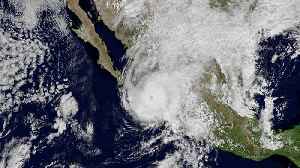 Hurricane Willa was downgraded to a tropical depression early Wednesday as torrential rain continued to lash west-central Mexico, the U.S. National Hurricane Center said. 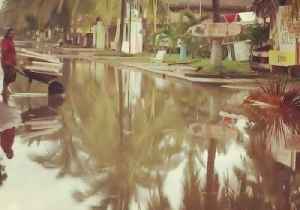 ▶ Videos for "Tropical Depression"
A tropical depression formed off the coast of Vietnam and Malaysia on New Year’s Eve, before being upgraded to Tropical Storm Pabuk in subsequent days as it neared Thailand. 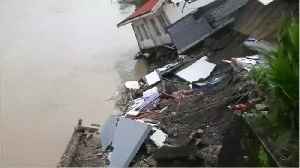 A Thai ship carrying..
Eighty-five are now believed to be dead and at least twenty missing after landslides and floods triggered by tropical depression Usman devastated the Bicol region of the Philippines on Saturday,.. 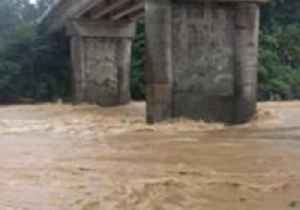 The death toll from landslides and devastating floods in the central Philippines triggered by a tropical depression climbed to 85, officials said on Wednesday. Francesca Lynagh reports. Philippine authorities worked to find survivors and recover bodies in the wake of fatal floods and landslides that have affected the province of Camarines Sur since December 29, when Tropical..
Antara Foto/Nurul Ramadhan/ via REUTERS MANILA (Reuters) - The death toll from landslides and devastating floods in the central Philippines triggered by a tropical depression climbed to 85, officials..
(CNN)Scores of people have been killed after a powerful storm swept through the Philippines over the weekend. 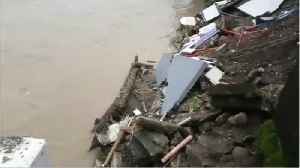 The tropical depression, locally named Usman, brought heavy rains on Saturday, causing.. Businesses were flooded in the province of Camarines Sur in the Philippines on Saturday, December 29, after tropical depression Usman made landfall, causing at least 56 deaths, according to authorities..
A tropical depression named Usman has forced more than 4,900 to evacuate central Philippines. No reporter narration. 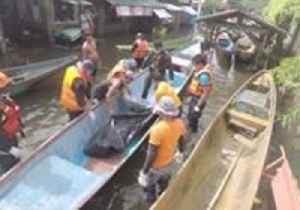 Flash flooding hit the province of Camarines Sur in the Philippines on Saturday, December 29, after tropical depression Usman made landfall, with high water levels causing travel disruption on December.. 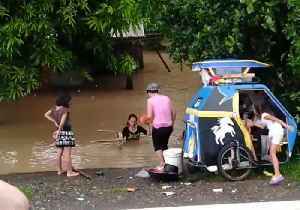 Flash flooding hit the province of Camarines Sur in the Philippines on Saturday, December 29, after tropical depression Usman made landfall. 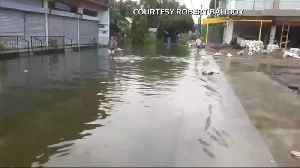 This video shows the flooding on the national highway in the.. 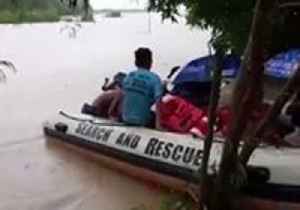 Firefighters rescued villagers trapped by flooding caused by tropical depression Usman on Saturday, December 29.This video shows a fire crew in a boat collecting villagers from Del Rosario in the.. Tropical depression Usman hit town of Santo Tomas in the Philippines on Saturday, December 29. 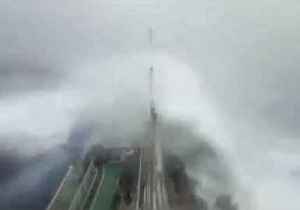 This video shows high winds and rain lashing the town in the province of Batangas. 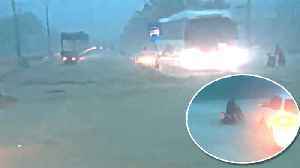 The storm made landfall..
Footage shows drivers and motorcyclists battling through flash floods in Tra Vinh, Vietnam, on November 18. 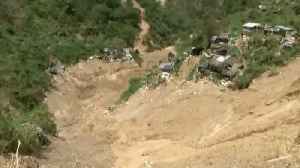 Flash floods and landslides affected hundreds of people in Vietnam as tropical depression..
Hurricane Willa caused flooding in San Blas, Mexico, on Wednesday, October 24, after making landfall the night before. San Blas, in the state of Nayarit, was among the towns affected by the storm,.. 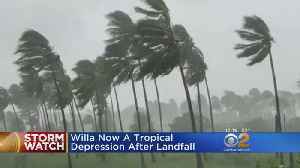 Forecasts predict Willa will bring 4 inches of rain and 35 mph winds to areas in its path. CBS2's Chris Wragge reports. 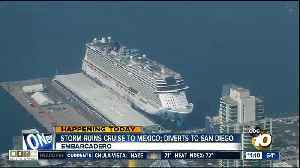 The Norwegian Bliss was diverted to the Port of San Diego due to Hurricane Willa in Mexico which is now a tropical depression. It's the largest cruise ship to come into San Diego’s port. 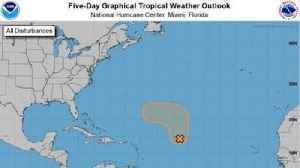 As of Wednesday morning, what is designated as Disturbance 1 was about 900 miles east of the Caribbean’s northern Leeward Islands and still more than 2,000 miles from South Florida. 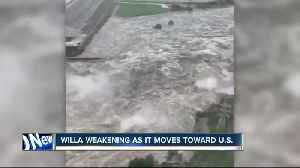 Despite being downgraded to a Tropical Depression, Willa is leaving her mark on Mexico as it moves towards the U.S.
West side neighbors will meet with Madison’s police chief and a judge Wednesday night about recent crime in the area. President Donald Trump will be visiting Wisconsin Wednesday. That leads off.. 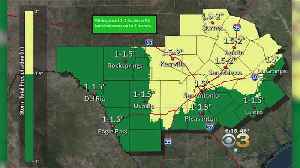 Forecasters downgraded the hurricane to a tropical depression Wednesday morning. 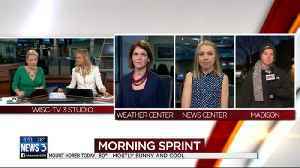 John Lorinc reports for CBS News. 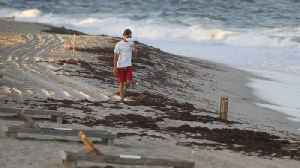 Depending on how the storm spread toxic algae in the Gulf of Mexico, Hurricane Michael could help or hurt the state's problem with red tide. 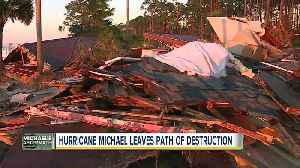 Hurricane Michael leaves path of destruction across Florida Panhandle. 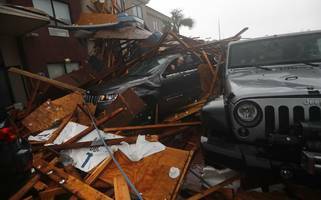 Did global warming &apos;supercharge&apos; Hurricane Michael? Hurricane Michael exploded in intensity this week, from a rather nondescript tropical depression Sunday with winds of 35 mph to a Category 4 monster. A tropical depression could form by early next week. · *Hurricane Michael made landfall Wednesday northwest of Mexico Beach, Florida. 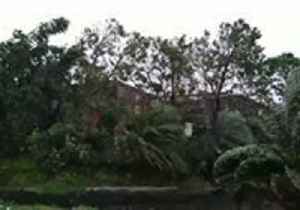 The powerful Category 4 storm brought winds of up to 155 mph. * · *Michael's low central pressure makes it the..
A tropical depression became Tropical Storm Michael on Sunday and may become a hurricane by midweek, potentially bringing storm surges and heavy rainfall to the U.S. Gulf Coast, the U.S. National..
A tropical depression churning in the Caribbean was upgraded to Tropical Storm Michael and may strengthen to a hurricane mid-week as it heads toward the Florida Panhandle, forecasters said. Forecasters say a tropical depression in the Caribbean could strengthen over the next several days and become a hurricane by midweek. The tropical depression is currently centered about 100 miles east of Chetumal, Mexico. Tropical Depression Fourteen formed overnight south of Cancun, Mexico. The chance of tropical formation was 50 percent over the next 48 hours and 80 percent over the next five days. Forecasters now give it a 70 percent chance of becoming a tropical depression in the next five days. It has a 20 percent chance of developing into a tropical depression within the next 48 hours and a 60 percent chance through five days. A tropical depression could form in the northwestern Caribbean Sea or the southern Gulf of Mexico as the system moves slowly northwestward. It has a 30 percent chance of developing into a tropical depression. PHOENIX (AP) — Remnants of a tropical storm drenched parts of the desert Southwest on Tuesday, trapping some drivers on swamped Phoenix streets as authorities prepared for possible flash flooding in.. The afternoon commute may not be as challenging for Valley commuters as what they experience this morning following record rainfall across the area. Rainfall Tuesday from Tropical Depression Rosa..
Parts of the southwestern U.S. are bracing for possible flash flooding from Tropical Depression Rosa as it moves in from Mexico. Downpours are expected to move across Arizona all day Tuesday and into..
Kirk if forecast to weaken into a tropical depression Friday night. MIAMI (AP) — Kirk has reformed as a tropical storm in the eastern Caribbean, and forecasters say it’s gaining strength. The system was downgraded to a tropical depression earlier this week. But the.. Tropical Depression Kirk is zipping along to the west. The depression had maximum sustained winds of 35 mph and was moving west-northwest in the Atlantic at 6 mph. Culiacan, Mexico, Sep 21, 2018 / 06:01 pm (ACI Prensa).- The Mexican bishops' conference called for solidarity Friday with the thousands of people affected by heavy rains and flooding in Sinaloa state,..
Three of the four had a medium to high chance of forming into a tropical depression or storm, but none yet posed a threat to land. Raleigh, N.C., Sep 19, 2018 / 03:01 am (CNA/EWTN News).- While Hurricane Florence has decreased to a tropical depression, it is still churning up tornadoes and bringing record flooding throughout the..
Thousands of miles away from the deadly deluges brought by the now-tropical depression Florence, wildland firefighters are still battling extreme blazes out West. 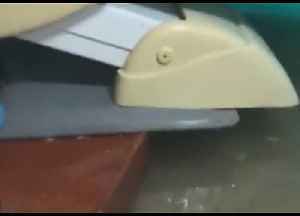 An intense video posted to..
CHARLOTTE, N.C. (AP) — Florence — which was once a hurricane and now is a tropical depression — is being blamed for at least 20 deaths in the Carolinas. Fourteen were in North Carolina. Officials.. Deeper flooding loomed in the hours and days ahead from rivers in the Carolinas swollen by Tropical Depression Florence, which has killed 23 people, even if rain-weary residents got a brief glimpse of..
Florence is now a tropical depression, bringing rain to the Mid-Atlantic. WILMINGTON, N.C. (AP) — The Latest on Tropical Depression Florence (all times local): 10:40 a.m. A North Carolina sheriff's office says it has recovered the body of a 1-year-old boy who was swept.. The Latest on Tropical Depression Florence (all times local): 10 a.m. Downgraded from hurricane to tropical depression, Florence continued Monday to wreak havoc in the Carolinas as it works its way north, dropping massive amounts of rainwater and flooding already..